Veterans Plaza's officially been open for two weeks now, and I've been out there with my camera going all William Whyte on the space. It looks like the space is being well-used at all times of day and night, meaning it could easily be declared a success. And it's safe, too. When I took the nighttime shots at 11pm last Wednesday night, I saw two young women on benches using their laptops. Women alone using expensive electronics at night? Sounds like a safe space to me. People are certainly shaken by the assault that happened next to the plaza last week, but aren't too afraid to continue going there. Of course, there were skaters in the plaza each time I was there, but they appear to be sharing the space with everyone else. In the video, you can see teenage skaters taking turns using a space with much younger kids on scooters. In another scene, skaters have taken over the ice skating rink (covered up for the warmer months) as a sort of arena and spectators have gathered to watch. Ellsworth Drive has a history of random crowds forming around skateboarders, which makes me wonder if these kids are really the nuisance they're made out to be on listservs or a pretty raucous comment thread on Greater Greater Washington. I wonder: do non-skaters consider spontaneous displays like skating an attraction to downtown Silver Spring? 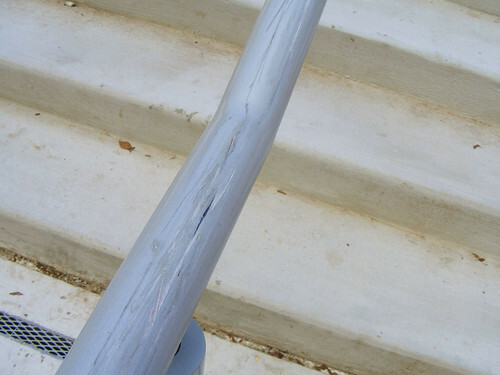 A damaged handrail in Veterans Plaza is the only visible sign of damage from skateboarding. But good things aren't what Reemberto Rodriguez - director of the Silver Spring Regional Services Center, whose new offices are in the adjacent Civic Building - is hearing. I asked him if "No Skateboarding" signs will be going up in the plaza, as Sk8ter Mom suggested in a comment here the other day. "As of now, they are not banned," he replied. "There is increasing evidence of destruction to property and disruptions of others sharing the space by skateboarders." It appeared that my fears of conflicts arising over skating in the plaza had become a reality. But what damage was Reemberto talking about? I gave the plaza a thorough looking-over Friday afternoon and found very little. The wood slats on the benches aren't chipped. The pavers look fine, and the concrete pavers have tire tracks on them - signs of construction vehicles, not skateboards. Of the several handrails in the plaza, a few of them appear to have been skated on. But just one (pictured above), located next to the ice rink, has been seriously marked up, suggesting that the skater kids have picked a favorite. Skaters and construction workers in the ice rink. it's the safest and best spot that all of us have skated and all us skaters know that it wasn't meant for that but i mena come on now, it should've been known from the start. now last week when it first opened up and i went to skate it, I was told that skaters were allowed to skate there as long as we just skated the ice rink and we didn't grind or mess up the benches and what not. i complied with that and so did many other skaters who usually skate down in dtss. but now it wasn't until all these other people came and started skating and decided that it was a good idea when others and myself told them not to . . .
don't let the actions of others overshadow the actions of many. in which in this case don't blame all skaters for what one did. if you're gonna ban a group of people ban the people who choose to fight there or rob people in that area not the skaters. Note the concept of "ownership." "It's the safest and best spot that all of us have skated," Alexander says: these kids appreciate the plaza. They were given guidelines and are following them: only once did I see kids away from the ice rink, and even then, they didn't do anything to the benches. "Others and myself told" kids from "outside" their peer group not to screw around there. This is what public space is supposed to be about, y'all. As I wrote last year, "Give these kids a prominent place in the community and they'll show it respect. Push them aside and they'll act out." It sounds like these kids are doing exactly what they're supposed to do - exactly what you or I or anyone should do with a public community space. Those who complain about damage and misconduct in Veterans Plaza might want to go down there themselves before they speak next time. I still think a dedicated skate park would be better for the skaters, especially once the ice rink part is actually ice. But, as a non-skater, as long as they stay to the ice rink, which looks like it was designed for skating, I don't care. I will be bothered if they are using the wooden benches for skating, but if they stay to the ice rink, I and most people won't care. The ice rink currently has no real use, so if people make use of it, so be it. My wife said she thought it looked like a skate park when she first saw the ice rink and Veteran's Plaza. It would be a bit ironic if skating was banned from the plaza. It's too early to see much damage, but if there is a lot of damage, the county would be right to consider a ban. It was paid for by the public, and if a small minority of the public (largely not part of the tax base) is causing undo wear and tear, it makes sense to erect a ban. Ultimately, if the skaters are respectful of others, and confine themselves to a largely useless space right now, they'll be fine. If they cause issues and start using the wooden benches, then we'll have issues. It's good to see the skaters being respectful. The onus is on them to make this work. If they are respectful, don't cause much wear and tear and stay out of the way of pedestrians, this will work out. 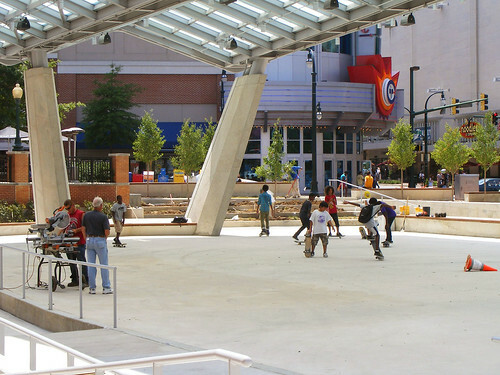 As a former skater and brother of a former skater, I support and have always supported a full-sized skate park in or around downtown Silver Spring (such as the original plan on Fenton at Philadelphia Ave). But damage is damage. With the plaza having been open for only 2 weeks and for you to have already pointed out any sign of damage at all is a bad omen. The finish on brand new (and expensive) handrails will probably be just the tip of the iceberg. Unfortunately, child peers telling child peers in this context not to do something usually doesn't work in a public space if there is no authority to actually enforce rules. You yourself are surely aware of this considering we're probably about the same age (aka young and still closely in touch with how middle and high schoolers think). Fact is, a skate park should have been built before the plaza and civic building were finished because the adults in charge of planning probably did think that skaters would start "tearing up" the yard as soon as it was finished. On the other hand, the skaters shouldn't assume at the same time that planners are going to just know and accept that skaters will use the space once it's done. That's admitting immaturity before it's even committed. "C'mon, they should've known we're kids with no self control and we're gonna act like kids once it's built because we can't help ourselves but to skateboard over anything that looks worthwhile". Skateboarding isn't bad, but showing zero self-restraint and damaging a public space in the process definitely is (not to mention against the law). You have to admit that given a short amount time, all of the benches, concrete edges, and rails will start to show wear and tear from skateboarding--wear and tear that is beyond the normal amount for normal use. The cure for now is probably to have someone on the beat with a stern and strict form of authority to prevent it from happening any further. Let the kids skateboard all over the rink area rather than on rails, concrete walls and benches, but they need to prove they can show self-control, maturity, and self-governance at the same time if opinions are to change. My only problem with skateboarding is the racket. Hard to hold a conversation on the plaza with all the banging of boards on concrete, metal rail and wood. Am thinking the shelter-structure amplified it. Anyway that can be dampened? In any case, the skate rink just got a border/railing around it - methinks the skateboarding in that portion of the plaza is now over. Skateboarding will cause damage. Even on concrete. I don't even see that as debatable. And, I've seen them using the benches. If skateboarding is to be allowed (I don't have a problem with that) there should be some accomodations made. Maybe, they could allow some movable jumps and ramps to be put down to discourage them from using the rails and benches. Maybe, they could require skaters to be carded. If they don't follow the rules the card gets revoked. I agree that the space over the ice rink is essentially useless if not for skating. They should totally throw some ramps or something down there for them - if they have something that is meant to skate on, what would be the point of using benches or rails? I like Big Bubba's idea of having a card system. I would also like to see those kids wearing some kind of safety gear. The Veteran's Plaza is a great place for concerts and performances, it's unfortunately probably not the best place for our skaters as it was never designed as a skate park and there just isn't enough adult supervision - our skateboarders really need another skate park (in addition to the one at Woodside). There has been talk about converting the old Silver Spring Library into a youth center once the library moves...there is probably room in Ellsworth Park (the grounds next to the library) for another small (unfortunately) skatepark, and still keep some playground space as well. Then whole families could go, littler kids could play on the playground, older kids could skateboard, Mom and/or Dad or other adult could be on hand to help guide youth to use the space appropriately (leave it as nice or nicer than when you arrived, try to not do anything that risks harm to someone else). Then they could go over to the new youth center and do activities and then follow up with an ice cream or movie in downtown Silver Spring...perhaps it's a bit naive of a vision, but maybe it would work?? ?